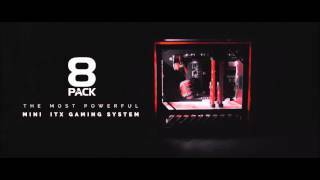 8Pack, the UK's number 1 ranked extreme overclocker would like to introduce you to his new range of extreme performance PCs. Working closely with most of the world's leading motherboard and memory manufacturers to help improve their product performance, 8Pack uses his expertise to challenge for new performance world records on an almost daily basis; and now he brings this expertise to Overclockers UK to develop and build the most extreme performance PCs on the planet! Overclockers UK and 8Pack offer the option for you to customise the look of your system. We are able to provide a high quality, industrial grade, powder coating service for the outer shell of your case and we offer a range of colour combinations for the watercooling fluids and fittings to choose from. This is yet another way to ensure that your system is uniquely tailored to your own tastes. The Asteroid was designed to be the ultimate HD LAN gaming PC. Portable and eye-catching, this graphical pocket rocket employs the powerhouse RTX 2080 graphics card, overclocked and water cooled to give impactful visual performance whilst remaining quiet and cool. In any location, in any game, the Asteroid will enable you to dominate the competition. In addition to the system itself, to aid portability, the system come with a custom flight case. The system uses an Asus Asus ROG Strix Z390I motherboard, the ultimate in compact gaming boards, featuring a high quality dedicated headphone amplifier. At the heart we have an Overclocked Coffee lake Refresh Core i7 9700K Eight Core CPU which is the current gamers' choice due to its efficient architecture and very strong memory controller. This is paired with the insane Team Group 4000MHz 8Pack edition DDR4 memory which aesthetically matches the exciting Asus motherboard and gives the CPU all the memory bandwidth needed to decimate all the competition. This system is housed in a custom designed Parvum Cube case, with integrated reservoir and fluid flow tracks. This stunning chassis has sufficient airflow to allow the fan speed and thus noise can be kept very low. Each set of radiator fans can be controlled through software in Windows so the balance of cooling and noise can be adjusted for different scenarios. Storage is provided by a pair of ultra-fast Samsung 970 Evo solid state drives configured in RAID 0 for maximum speed. - Specialist delivery and installation. Fitted with EK Full Cover Waterblocks and Overclocked to maximum stable overclock. * The system specification can be modified upon request. You can discuss your purchase with 8Pack himself to ensure that you get the absolute best system possible. * Please note - Due to 8Pack work commitments the minimum lead time for these systems is 21 working days. We will always endeavour to meet this deadline but at busy times delays may occur. We will keep you informed of the system build progress. More links for "Asteroid - Intel Core i7 9700K @ 5.1GHz DDR4 Extreme Overclocked PC"
"Ultimately if you’ve got deep pockets and are looking for a fantastic compact gaming system, and certainly don’t want the hassle of assembling it yourself, then OCUK has you covered. Nonetheless, even an experienced PC builder can appreciate the craftsmanship that has gone into the 8Pack Asteroid." "If you want one of the most customised PCs available today, though, and your priorities are low noise, great looks, fast gaming performance and a small chassis, your choices don’t come much better than the Asteroid." "The Asteroid is one of the best PCs I've ever seen. It's a small and impeccably-designed rig with enough power to cope with any gaming scenario, from 4K and demanding graphics options to widescreen and VR."